What routine maintenance does my Master Bid List need? While your team uses the bid list on a daily basis, it can build up some extra information that increases the size of your Master Bid List and makes it less efficient. There are a few routine maintenance tasks that should be performed to the Master Bid List to keep it operating at peak performance. These include removing deleted contacts from the Master Bid List and making sure a Primary contact exists for each company in each trade division. See details below. To perform this maintenance you need to be in Master Bid List mode (show me how). Note: be cautious in Master Bid List mode as the cells are not locked and you can overwrite information. 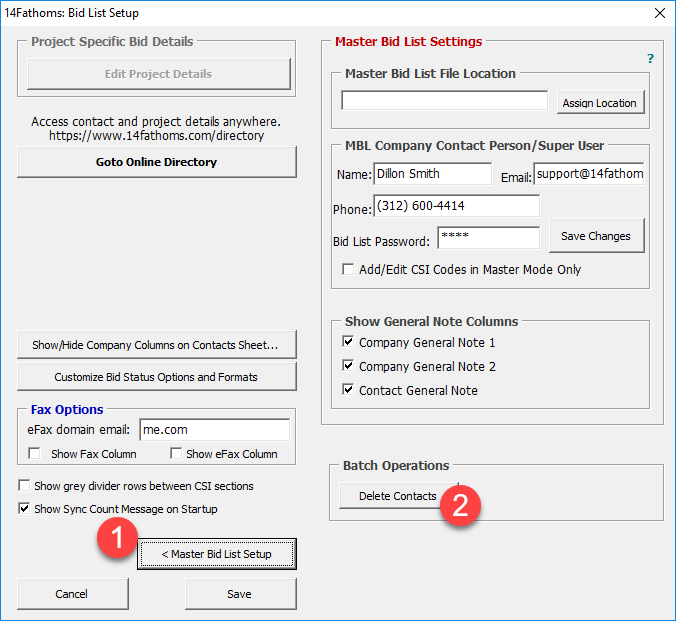 When contacts are deleted or moved on Project Bid Lists they are removed from those bid lists and just marked for deletion on the Master Bid List with a red background and struck text. This allows your company super user to review contacts and companies that have been deleted and either permanently delete them or undelete them in case someone accidentally deleted a contact on their Project Bid List. Prompt after clicking Delete/Undelete button. Show who and why the contact was deleted. To see all the contacts marked for deletion click the “Other Filters” dropdown on the Bid List Tool toolbar and select “Filter on contacts marked for deletion”. Scroll over to the “Last Modified” column and hover over the cell to see the comment which show who deleted the contact and why the contact was deleted. Click “Bid List Setup” in the Bid List tools toolbar, then click the “Master Bid List Setup” button. Lastly, click the “Delete Contacts” button in the batch operations section. 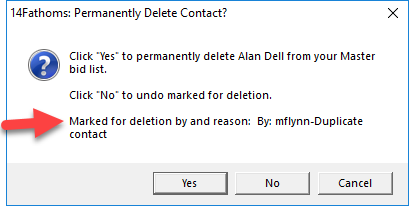 This removes all the contacts marked for deletion very quickly. 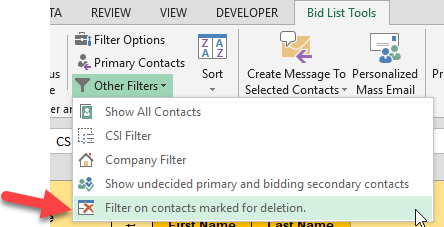 Deleting unused contacts keeps the bid list smaller and is quicker when creating a new Project Bid List. Note: If you permanently delete a contact from your Master Bid List and later realize it was a mistake, contact 14Fathoms to get the contact added back. After deleting contacts there is a possibility that a company could be left without a Primary contact. Primary contacts are those that typically receive the invitation to bid. Everyone else at the company is a secondary contact. If you filter on Primary contacts only before sending an ITB and the company doesn’t have a designated Primary contact, that company may not get an ITB and leave a gap in scope coverage. A “Primary Check” column is added next to the Contact Type column. Use the symbol legend that opens to determine if a company is missing a Primary contact. If so, double click to open the contact and make them primary. Every a company should have at least one Primary contact per trade division. Once you make the change, the Primary Check symbol is removed. When complete click the “Close” button on the Symbol Legend box to remove the Primary Check column. As always, contact us with questions. ← What is the “Quick Edit” button in the Bid List and how do I use it?